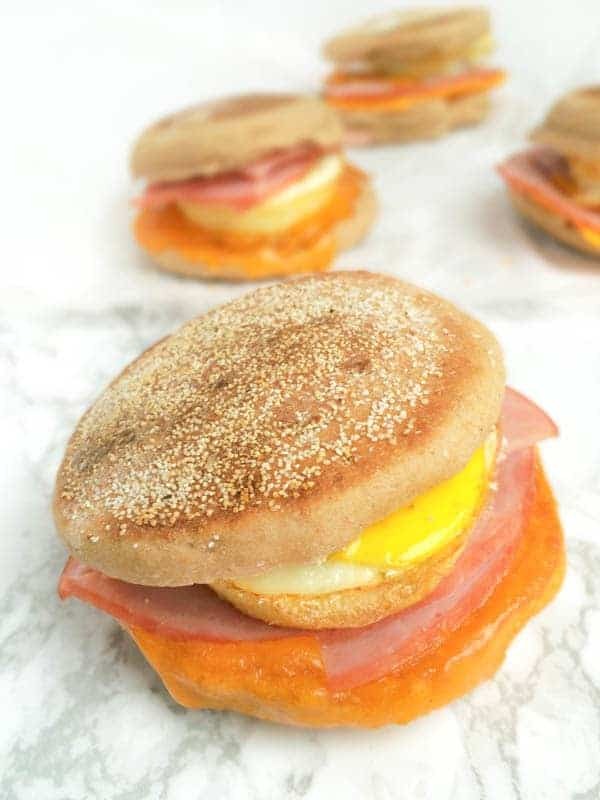 Protein packed and just 320 calories each, these satisfying breakfast sandwiches are ideal for making-ahead, freezing and popping in the microwave whenever the mood strikes. My love for the popular fastfood breakfast sandwich began at a very young age. It all goes back to the 80’s when my Aunt Paula and Uncle Randy who would stay with me and my sisters for a week while my parents vacationed somewhere warm to escape the brutal Michigan winters. Lazy bums who loved to sleep in, we rarely made it to McDonald’s in time to catch the ever-elusive breakfast menu. Lucky for us, Uncle Randy, a postal worker, is an early riser and would sneak out early to buy bags of Egg McMuffins and crispy hashbrowns that Aunt Paula would keep warm for us in the oven until we woke up. 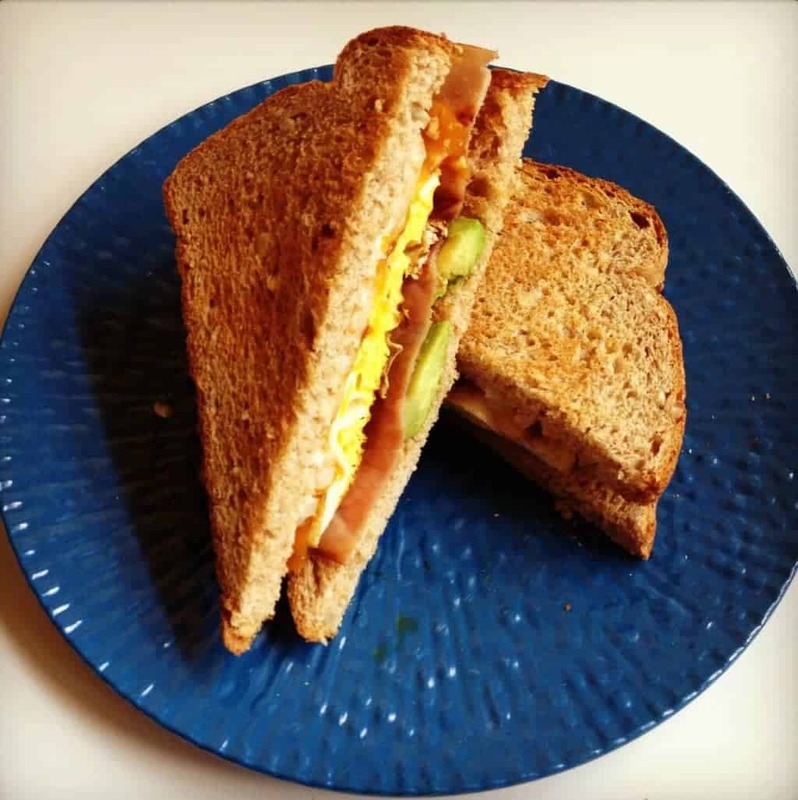 One of the few foods that would ease morning sickness during my pregnancies, egg, ham and cheese breakfast sandwiches remain one of my biggest comforts to this day. 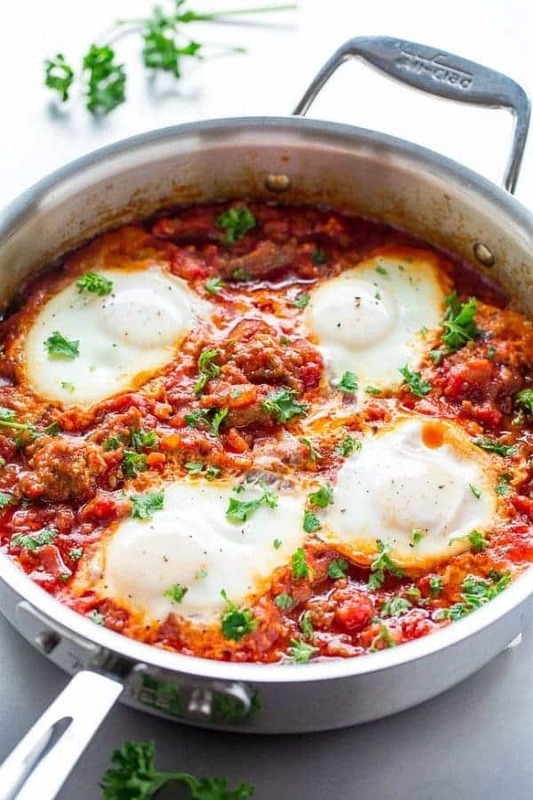 Delicious any time of year but ideal with boneless spiral ham, I knew it was time to share this recipe when the Ohio Pork Council asked me to create a recipe to help folks utilize Easter leftovers. What is your favorite recipe for leftover ham? I’m always looking for new ideas! Pre-heat the oven to 350 degrees and spray a muffin tin with cooking spray. 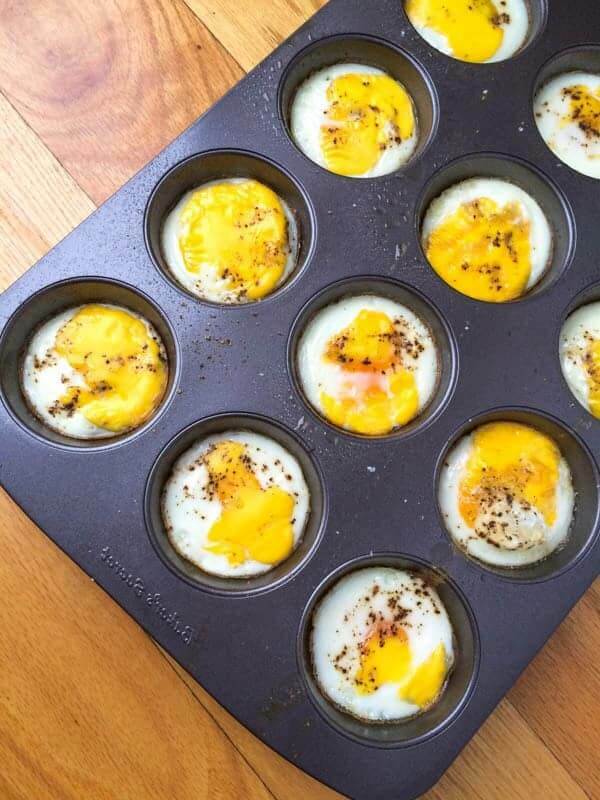 Crack one egg into each muffin tin and sprinkle with salt and pepper. For even baking, gently break the yolk using a fork or knife. 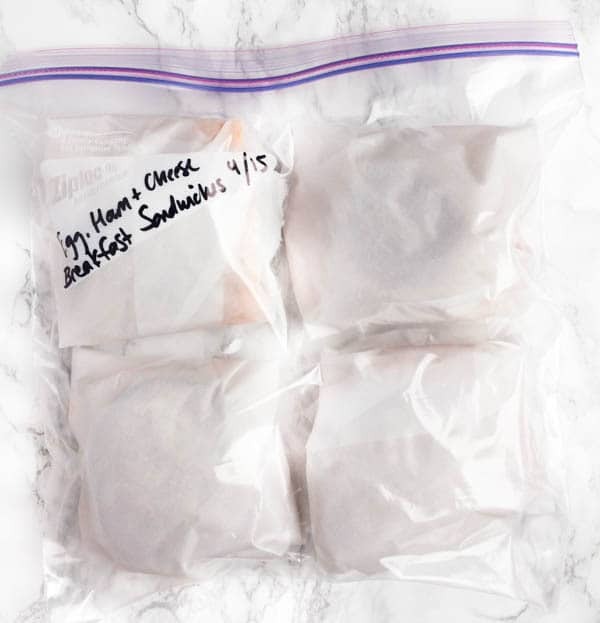 For easy microwave reheating, wrap each sandwich individually in parchment paper then place in a resealable plastic bag to freeze. To reheat, simply place in the microwave for 60 seconds on full power or 1 1/2 minutes on 50% power. Do you toast the English muffins at all before assembly? You can but it’s not required! How long would these last just refrigerated? For sure up to 5 days!! How long can these be frozen for? We’re not great meat eaters in our house but do love our cooked breakfasts now and again. These would be great to take for a pit stop when we head out walking early! Eggs and ham are always welcome on my breakfast plate! 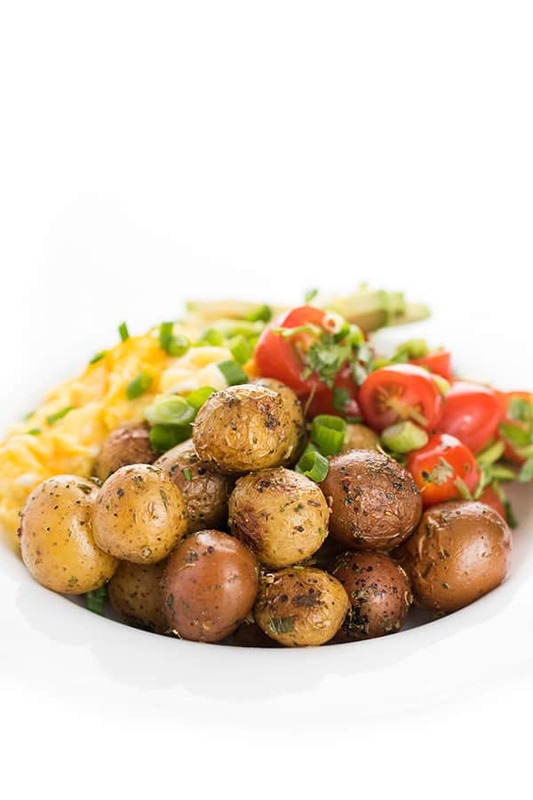 Love this freezer-friendly breakfast! Sadly, we did not have ham for Easter, so no yummy leftovers. :( But…I do have Canadian bacon slices that are English muffin sized, so THAT is what is going on these tasty breakfast sammies! I just made some turkey sausage breakfast sandwiches last week. They’re so convenient on busy moorings or when I need a quick lunch on the go! I want to make them with turkey sausage next!! Such a great idea! I know this is a great way to have a fast breakfast packed with protein. I nearly bought the Jimmy Dean frozen variety last week. So glad I found this instead! You’ll love these and realize how much cheaper and tastier they are than store bought! More than two years later … I actually made these, Liz. Just tonight! They look delicious, and I can’t wait for the girls to have them in the morning. You know I love these!! the fact that they can be made ahead is absolutely BRILLIANT! Super smart to have these in the freezer. 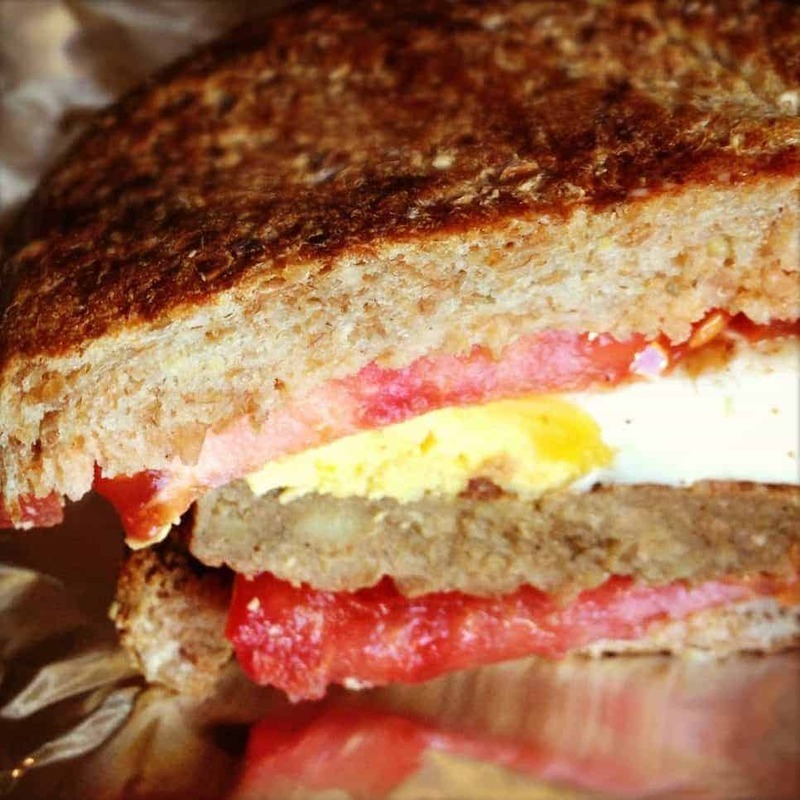 My boys love breakfast sandwiches and I want to make these soon. Let me know what you think if you try them!! I’m not sure any of these sandwiches would even make it to the freezer before I ate them all. How satisfying would those be! I am making these, and pinning! I could eat this every single day and never get tired of it. ME TOO!! lol It’s my ideal breakfast. These are great, I love that they are freezer friendly! I love make ahead breakfast sandwiches. My kids eat them almost every day! Now that I’ve started mine keep asking to! I love that these are freezer-friendly, they look awesome and so perfect for the kids! My boys scarf them down at a scary-fast rate! I love love love breakfast sandwiches! I’ve been looking for make-ahead breakfast solutions and I think I may have just found THE thing. I can’t tell how how many frozen breakfast sandwiches I’ve tried (well, my husband can tell you – every single brand) and I always hate the ‘fake’ taste. Why oh why have I not made them on my own? You rock and I can’t wait to make these! They totally would – plus they are great with sausage too!! Only 320 calories and you can make this deliciousness ahead? Sign me up! I love this! Yes girl!! And you’re not hungry an hour later like most low calorie breakfasts! It’s really beautiful. My family would LOVE these freezer friendly sandwiches!! So perfect for on the go! I think there is a mistake? simply place in the microwave for 90 seconds on full power or 1½ minutes on 50% power. Oops !! Thanks for catching that – should be 60 seconds full power, 90 seconds 50%. :) Just updated – thank you!! You have the most clever recipes! These would be a life savor in our household. That’s not possible because YOU have the most clever recipes. PS I get to see you next week!! I have ham in the fridge just begging to be used for breakfast sandwiches. These look perfect, Liz! So technically, we don’t celebrate Easter. But since that’s one of the few times I can get a ham at the market without special ordering one, I take advantage of it. I’m no dummy. I made my favorite honey-orange glazed spiral one yesterday and have lots left over for these sandwiches! I win. Loove this fun breakfast idea! Great idea to have ready in the freezer! I bet your boys would love these Jenny! This is SUCH a brilliant idea!! Homemade freezer breakfast sandwiches!! Love this! I am a sucker for breakfast sandwiches and usually save them for the weekends as I like to try them from different cafes and restaurants. But these make a very good case for preparing them at home. I love that they’re freezer friendly…so smart. They’re just so nice to have when you don’t want a cold breakfast and totally guilt free!